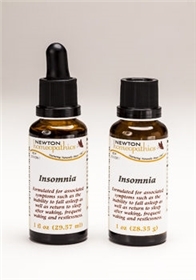 For relief of difficulty in falling asleep or getting back to sleep when awakened use Insomnia complex. Directions: Take 3 to 6 drops on tongue in the late afternoon and again at bedtime. Ingredients: Absinthium, Belladonna, Calcarea carbonica, Camphora, Chamomilla, China,Coffea cruda, Gelsemium sempervirens, Hyoscyamus niger, Ignatia amara, Kali bromatum,Passiflora incarnata, Pulsatilla, Scutellaria lateriflora 10x. Cypripedium pubescens, Humulus lupulus,Passiflora incarnata, Valeriana officinalis 3x. Alcohol 20%.